Our countertops are available in many products such as granite, marble, engineered stone, all solid surface products and more. We provide competitive pricing, custom design, quality craftsmanship and most importantly, on-time expert installation. A custom counter top for your new kitchen? Think of the possibilities! With over 130 colors to choose from, you can create a space as individual as you are. Make it your own with inlays, seamless backsplashes and inline sinks. We can help you choose the perfect counter top that is tough enough to stand up to everyday realities of your busy home. DuPont’s Corian Countertops are industry leaders in functional, beautiful counter top design. Easy to clean and nonporous. With proper cleaning, Corian® countertops also resist the growth of mold, mildew and bacteria. Corian® is also heat and scratch resistant. In addition to Corian, we offer custom granite slab, ceramic tile and stone tile counter tops. We also carry a recycled glass slab made by Vetrazzo. Granite is visibly granular but can have a lot of movement. It consists primarily of quartz, mica and feldspar. Granite is the hardest architectural stone and the least porous. It is highly recommended for kitchen countertops and it works well for any other applications. 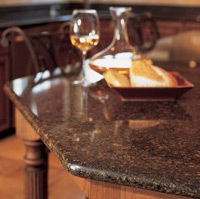 Imperfections – Mineral spots are inherent to granite. These are small spots that can show slightly lighter or darker in any given area but can make the countertop one-of-a-kind. “Fissures” are often mistaken for cracks in the stone. These are not cracks or defects, but rather a natural part of the stones beauty. Surface Finishes – There are a selection of finishes that are available to change the look or feel of the surface of granite including; polished, honed, caress, antiqued (leathered), Tuscan or bush hammered – ask us for details. Color Variation and Veining – All natural stone slabs will vary in color from one slab to the next and will also vary in color within the same slab. No two slabs of the same color will be exactly the same. All natural stone will have some veining within the slab. This is a normal characteristic of the stone and is not considered a defect. Marble is a metamorphic rock found in the mountainous regions of most countries of the world. Marble quarried in India, China, Italy and Spain repersents the majority of marble, in terms of volume, that is utilized worldwide. These stones are typically composed primarily of carbonate minerals, calcite and dolomite, either singly or combined. These stones are much softer than granite and consequently will scratch, dent, chip and cut much easier than other stones. They are also more porous and will stain and watermark easier as well as acid etch with some common drinks like soda pop and orange or grapefruit juice. Polished Marble or Honed Marble? If you actually want to use your marble countertop and not just look at it, the best advice is to choose honed marble. This material has a matte finish because the final polishing step is skipped. Polished marble has that lovely shiny look, but every drop of alchol, perfume, tomato juice or lemon juice will leave spots on the finish, and you’ll be spending all your time trying to get them to sparkle again. Combining the functionality and durability of solid stone and the flexibility and practicality of man made materials, engineered stone countertops might be a good solution for your countertop needs. Man-made countertops often called quartz are normally made from approximately 93% natural quartz and 3% resins, 1% pigments, and 3% binders. 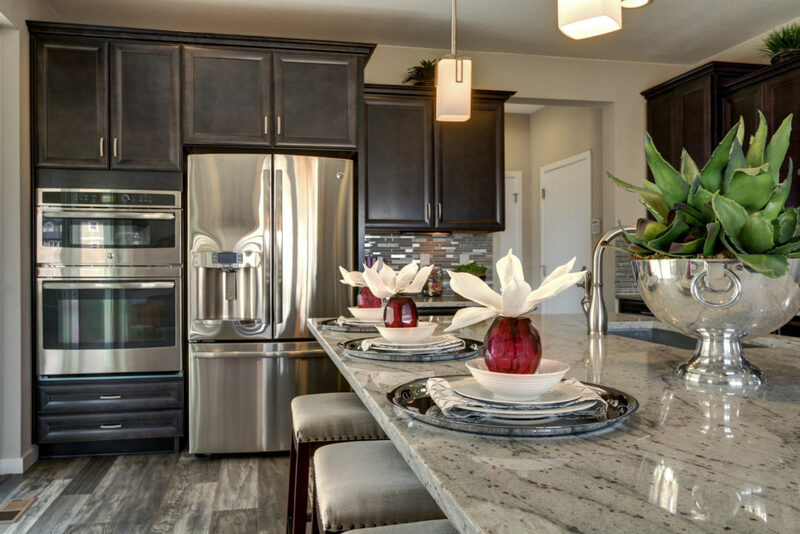 These countertops give a visual impression very similar to granite, and the colors are more consistent. They are heat- and scratch-resistant, but not heat- and scratch-proof. Therefore, the use of trivets or hot pads are recommended with hot pots and a cutting board is recommended when using a knife. Man-made countertops, available in a huge variety of colors and visual textures. 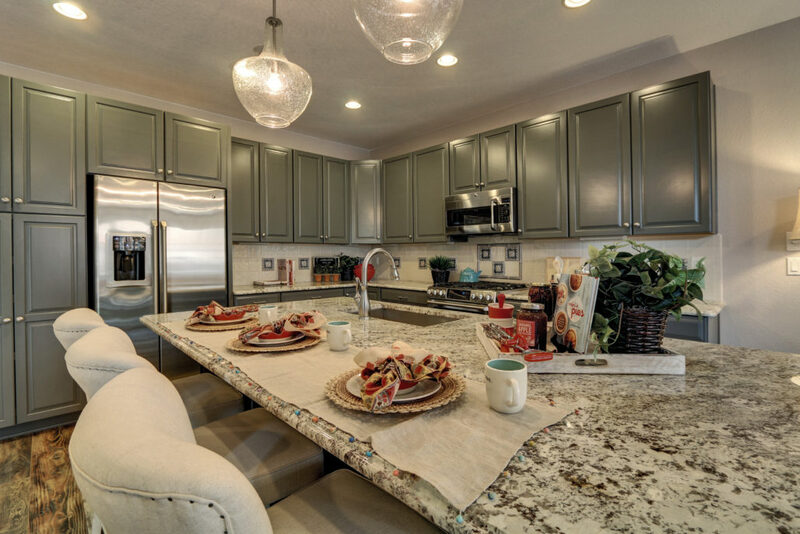 Solid surface countertops are a long-lasting option that’s easy to care for. Solid Surface products are manufactured with high performance resin systems such as acrylic and unsaturated polyester. They have very high filler content and do not have gel coats. A design benefit of solid surface materials is their ability to be machined to like wood, though special equipment and fabrication procedures are required. They can be precisely cut and bonded to fit nearly any surface shape. Solid surface materials can also be routed for decorative edging which can be applied with specially formulated adhesives. Since the color goes clear through the product, scratches, chips and stains can be easily sanded out.